A major stepping stone goal for China is orbiting a large space station, a facility targeted for the 2020 time period. Chinese space officials are rolling out a welcome mat to other nations eager to gain access to their future space station. 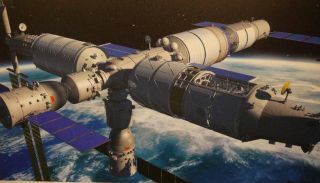 The Chinese government has designed a multiphase station program aimed at launching a Tiangong 2 space laboratory around 2015, an experimental space station in 2018, followed by a 60-ton multi-module space station in the 2020 time frame. According to Chinese news reports, some 150 participants from more than 20 countries, regions and international organizations took part in the four-day event, exchanging views on space technology cooperation. The workshop covered a wide swath of space topics, ranging from national, regional and international space programs to the role of Asia-Pacific space cooperation in advancing space technology. Other topics included microgravity science, space mineral resources, and the development of manned space science activities for Chinese youth. Elliot Pulham, chief executive officer of the Space Foundation in Colorado Springs, Colo., took part in the workshop and branded the gathering as significant. He was the only U.S. citizen to make remarks at the ceremonies commemorating China’s 10th anniversary of human spaceflight. "There were many presentations from countries that we are accustomed to viewing as 'space applications' users, and not human spaceflight players," Pulham told SPACE.com. "And yet the degree to which space experts from the various nations have thought through all the benefits and applications of human spaceflight technology was striking," he said. "It is clear that the many, many countries with space programs of varying complexity and maturity have all thought exhaustively about what makes human spaceflight special, and how we can all leverage it to change the world for the better," Pulham said. 'Missing links' of Russia and U.S. The biggest "missing links" in the workshop, Pulham said, were Russia and the United States. Pulham observed that, at the moment, China's space station is the focus of the China Manned Space Agency. "They briefed the details of their China Space Station program without ducking any questions," he said. Niu Hongguang, deputy commander of China Manned Space Program, told workshop participants that China has attached great importance to its manned space program. "The Chinese government prescribed the 'three-step strategy' of development at the beginning of implementing China Manned Space Program," Niu said. "Within 21 years' development, we have sent 10 Chinese astronauts into outer space," Niu said, "and mastered the fundamental technologies of manned flight to and from outer space, extravehicular activities as well as space rendezvous and docking. And China Manned Space Program is entering a new phase of building the Chinese space station." China Manned Space Agency deputy director Yang Liwei, China’s first astronaut to launch into Earth orbit in 2003, speaks at the United Nations/China Workshop on Human Space Technology in Beijing Sept. 16-19, 2013. During the workshop, Yang Liwei, deputy director of the China Manned Space Agency, said his country is willing to provide training and open the Chinese space station to foreign astronauts. Yang is China's first astronaut and launched into orbit in 2003. Yang said many countries submitted proposals to the Chinese government during the development of the space station, hoping China would help train their astronauts and then send them to the station to conduct scientific experiments. "China is now in an appropriate position to assist developing countries in building the capacity and capability of conducting space activities," said Mazlan Othman, director of the United Nations Office for Outer Space Affairs. Zhou Jianping, designer-in-chief of China's manned space program, said the planned space station can house three astronauts on missions lasting about six months. But new modules could be added as needed for scientific research, he said. Zhou also said that China will be able to rendezvous with other countries' spacecraft at the space station. Furthermore, the country is exploring the possibility of carrying out a joint rescue operation, he said. The workshop commemorated the 10th anniversary of China's first human spaceflight by showing a feature film titled "Space Exploration — Never Stop." Wang Zhaoyao, director of the China Manned Space Agency, attended the workshop, and also emphasized cooperative ties to the space station. Cooperating in platform technology, which may focus on individual equipment or assemblies, or focus on the development of sub-systems or even capsules. Cooperating in space application in ways such as joint research and onboard experiments in space science and application, space medicine and other areas. Conducting exchanges and cooperation in astronauts’ selection and training technology with other countries. When appropriate, China may help other countries to select and train astronauts who can fly jointly with Chinese astronauts. Promoting technological accomplishments using the station, especially in developing countries and regions, so as to achieve common development. A participant in the Beijing workshop was Franklin Chang Díaz, former NASA astronaut and now CEO and chairman of Ad Astra Rocket Co., headquartered in Webster, Texas. "My impression of the U.N./China Workshop was very positive. I was happy to see the presence of developing countries like Costa Rica, Colombia, Mexico, Ghana, Nigeria, Somalia and others who consider space exploration relevant to their future," Díaz told SPACE.com. "I was also encouraged by China's clear overture to open their space station to international participants. Space has to be open to all nations and not just the rich ones. China's position is good news for the developing world," Díaz said. "The emphasis on assisting developing countries with their space program highlights how the Chinese are far more adroit in exploiting the diplomatic aspects of their space program than many other countries have been, including the United States," said Dean Cheng, a research fellow on Chinese political and security affairs at the Heritage Foundation in Washington, D.C.
Cheng said that the whole purpose of the Asia-Pacific Space Cooperation Organization (APSCO) has been to highlight China’s relationship with developing, rather than developed, space powers. "That Pakistan is lobbying to be the first country to visit China's as-yet un-launched space station is emblematic of this, especially given the long-standing Sino-Pakistani relationship,” Cheng said. "This also highlights how space is influenced by terrestrial politics. If Pakistan is the first foreign nation to visit China's future space station, that will have repercussions on Sino-Indian, and Indo-Pakistani, relations," he said. Elliot Pulham, CEO of the Space Foundation in Colorado Springs, Colo., speaks at the United Nations/China Workshop on Human Space Technology workshop in Beijing in September 2013. "This is not the first time China announced its intention to make its space station available to the international community," said Gregory Kulacki, senior analyst and China project manager for the Global Security Program at the Union of Concerned Scientists. Kulacki said it will be interesting to see how China selects international partners and projects for its national space station. "China won't complete the station until the early years of the next decade, but it seems as if China will be making an outreach to other developing nations, rather than to the well-established spacefaring nations participating in the ISS, from which China is excluded, largely because of U.S. opposition," Kulacki said. China’s willingness, and ability, to provide these kinds of opportunities in the country's space station effort, Kulacki told SPACE.com, "should make it clear that the U.S.-led effort to isolate China in space is an outdated, ineffective and ill-conceived policy that should be changed."